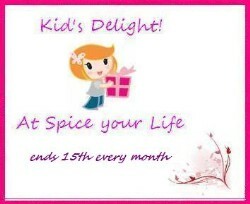 Spice your Life: Kid's Delight Party for Blog Anniversary! Kid's Delight Party for Blog Anniversary! It's a pleasure celebrating my Spice your Life! 's seventh year anniversary with you all! While I wrote so much in my last year's post, I find myself with no words to write down here! Life just keeps happening and we are in such mad rush to keep up with it. From what I have been reading on my own day to day life, it looks like all of us are in rush all the time. When will we pause to enjoy this moment? Well I do not know and I am more excited about the BM that keeps happening, that it never gives me much time to bother about anything else. With Konda giving her tenth this year, she is always busy with her studies. I haven't been cooking much and when I do, I have to manage everything on my own. That's fun too. Anyway as an anniversary celebration, I always host Kid's Delight, an event for the kids. The event showcases Kids approved dishes. For the anniversary party, I mostly make an entire menu during this month. Finally link back to the event's Announcement page or this page. If you can use the logo, it will be great.